Southern cooking | Dare Greatly! For many people $130 is not all that much, but in this family that’s a lot of money! Especially, when you start considering that you can add that to the money we’re saving growing our own herbs. Basically, I looked at my little kitchen window and I see that it all adds up to about $300 plus a year. Wait a minute, you say. Yeah, all of a sudden it starts to make sense, huh? $300 plus is nothing to sneeze at. So we bought celery and green onions, not organic or anything, just regular old celery and green onions. 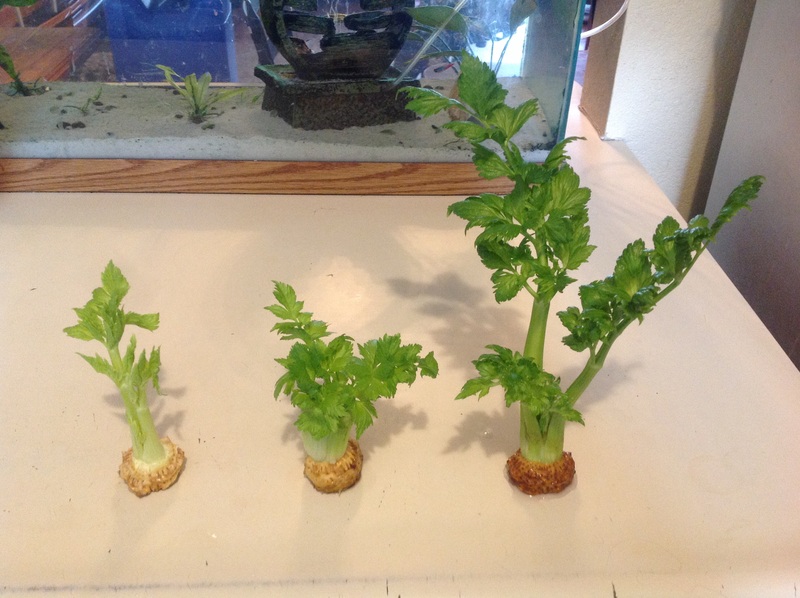 We used the celery like we always do, but as we got down to those last few stalks attached to the stump, I simply lopped them off leaving that little core of leaves in the middle. Then I put it in a jelly jar on the window sill. Everything was going great. It was growing like none other, then I put it in dirt like it said to do. I’m nothing if not stubborn. I’m trying again. This time I plan on putting cinnamon on the stump because it is said to be anti-fungal and anti-bacterial. I have three stumps growing very well, as you can see, but I’m not sure it is going to work because I still don’t have a single root on any of them that I can see. If it doesn’t work this time, I may have to break down and try the organic celery to see if that makes a difference. Now in regards to the green onions… Did pretty much the same thing as the celery. I cut all the green off and cooked it. The white ends were placed in a jelly jar on the window sill such that the water was only over the very bottoms. They sprouted roots immediately! When the roots were about an inch long, I transplanted them into this little pot. They’ve been helping to feed us for weeks now. It takes about three days for them to grow almost two inches. (CC has talked about setting up a time delay camera to capture the growth of these rascals.) I am starting some more from the grocery store today to basically double what I have in this one little pot. I feel that this amount doubled will give us all the green onions that we’ll need or want. 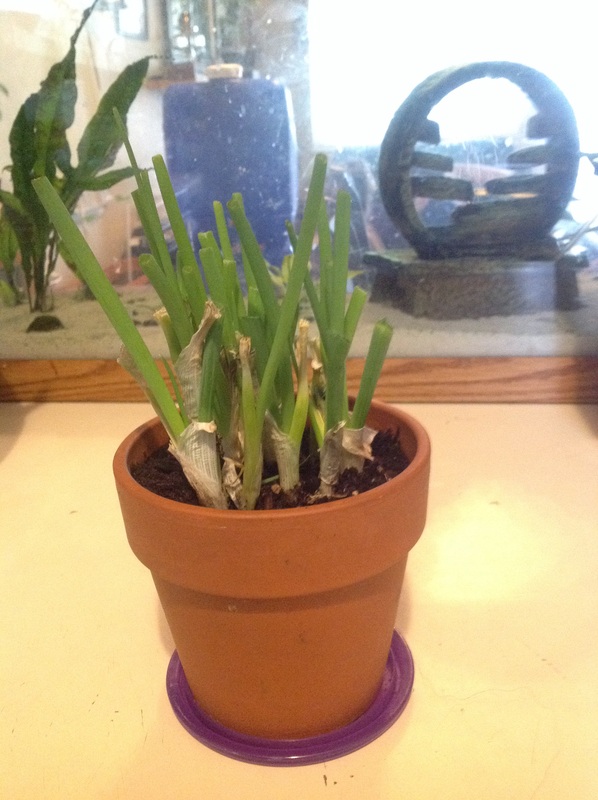 So hopefully today will be the last time I buy green onions!